Today, about 8 of us joined Gladys in running the Race for Hope:DC - a 5K run to raise funds in the fight against brain tumors. This was the first time Gladys had ever run a race - and ever RAN 3 miles non-stop. She had set a goal to run, joined a group that trained beginner runners and today was the day to put all that training to the test. Now, when I signed up, I did it quickly and didn't really look at the information regarding the purpose of the race. I just wanted to get registered so I could be there to support Gladys. When The FireMarshall and I arrived to pick up my race bib, we noticed a West Point Tent. We went over to investigate - thinking that maybe there were some cadet team entered. Come to find out, it was the tent for 2 Class of 84 grads who lost their son to a brain tumor. 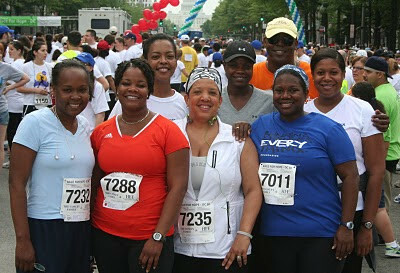 Hence, Race for Hope - Make a difference in the fight against brain tumors. My father died 10 years ago from a brain tumor. I hadn't thought about it much lately - and it just hit me. This race suddenly took on even more meaning for me. 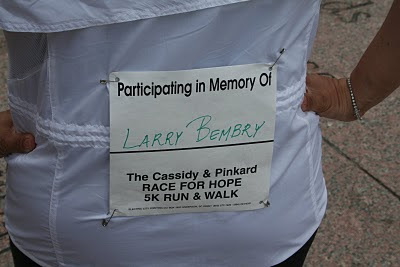 I found a "In Memory Of" bib and The FireMarshall helped me put it on. We were off and running. We never left Gladys and she ran the WHOLE WAY...the WHOLE WAY. I know I can speak for everyone else in the group - We are so proud of Gladys and her achievement of her goal. GO GLADYS!! !